“Picked as her best friend’s maid of honor, lovelorn and broke Annie looks to bluff her way through the expensive and bizarre rituals with an oddball group of bridesmaids” (United International Pictures). Verdict: Can’t quite understand why many suggests that this is the female version of The Hangover. If this is all that bridal showers are, it’s rather sad. 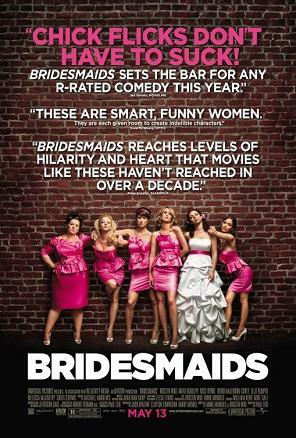 Bridesmaids is a decent comedy but surely, not as mad-fun and ground-breaking as “the male version” of the film. It’s certainly a more enjoyable movie for girls. The film also did not provide much opportunity for Kristen Wiig and Maya Rudolph to showcase their talent as seen on Saturday Night Live. Spot this on the closing credits: “Jersey Shore Couple” instead of “Jewelry Store Couple.” I wonder if they are gonna get fucked for this little gag of theirs. Malaysian censorship: Pretty much all the over-obscene adultery scenes are cut. Foul languages are not though, not at all. Second opinion: “Funny la but not interesting hmmm. I like the cop.” (Iris Loong). funny, but had some really draggy scenes.